To physicists, bacteria are beautiful little organisms to study because of their (relative) simplicity. They mostly come in conveniently shaped cylindrical or spherical single cells, and the organization of the cells are simple, at least compared to eukaryotic cells: there’s an inside, with all of the goo necessary for life, and a surface, which of course has a membrane, which distinguishes the inside of the cell from the outside, and a cell wall, which acts like an exoskeleton to provide mechanical integrity to the cell. But what’s going on with Gram-negative bacteria – these little guys have two membranes? Why? This is the kind of “Talmudic Question,” as Elio Schaecter might say, that furrowed my brow when I came to bacteriology from physics. The outer membrane has always been an enigmatic structure, and indeed our understanding of it as a structure has always lagged behind our understanding of its chemical composition, which in turn lagged behind our understanding of it as “something” that engaged the human immune system. Around the turn of the 20th century, the German physician-scientist Richard Pfeiffer found that heat-stable toxins associated with the cell (i.e., not soluble, secreted molecules) could actually kill Guinea pigs even when the bacteria themselves were dead. He termed this putative substance “endotoxin.” The “agglutinins” were discovered thereafter, and during the next several decades, the various types of antibody/antigen interactions were characterized (e.g., O- versus H-agglutination), but it wasn’t until the 1930’s before the O-antigen was found to be a component of lipopolysaccharide. Keep in mind, though, that we were still far from appreciating that lipopolysaccharide actually comprised a membrane. Electron microscopy had just been invented in the early 30’s, and while bacteria were the first biological specimens to be imaged, those first micrographs basically just showed dark blobs and left quite a bit to be desired (Movie 1). It took decades before advances in microscopy as well as associated techniques like thin-sectioning allowed the visualization of subcellular structure. The outer membrane was finally identified in 1964 (Bladen,1964, J Bacteriol), when it was also pinned as the structure possessing lipopolysaccharide, which was a huge breakthrough for medical microbiology. But big breakthroughs often bring with them a bit of intellectual baggage. In the final paragraph of that seminal paper, the authors write “[Peptidoglycan is] the cell wall responsible for cell integrity…The outer membrane is responsible for O-antigenic specificity [and] does not function in maintaining cell integrity.” While the authors had beautiful evidence to conclude that the outer membrane did contain the O-antigen, they had none to suggest that the outer membrane did not contribute to cell integrity, that is, to cell mechanics. The outer membrane certainly is a permeability barrier, and since 1964 seminal research has characterized its properties as such, including its importance for antibiotic resistance. Other excellent research has characterized its biosynthesis and its role during Gram-negative infection. While the textbook dogma that the outer membrane did not play a mechanical role persisted, there were several clues that led us to question this. The first was simply that lipopolysaccharides are highly charged (anionic). During graduate school I studied the mechanical properties of the plant cell wall – in plants it’s well understood that ionic bonds between charged polymers are critical for the load-bearing capacity of the wall. I figured the charges in the outer membrane could do the same. More importantly, in the literature you can find a number of “anomalous” cases where Gram-negative bacteria actually survive, and in some cases proliferate, without a peptidoglycan cell wall (Huang PNAS 2008, Yao Mol Cell 2012, Dorr PNAS 2016). 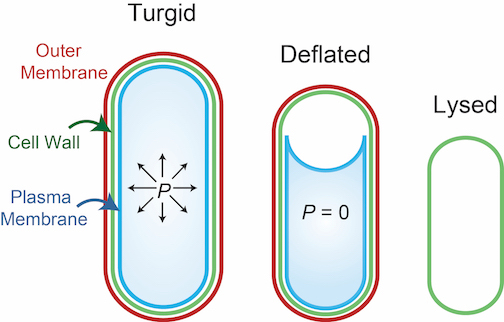 If the cell wall is really the dominant mechanical element required to bear the turgor pressure within the cell wall then this should be impossible! So the clues were there: we figured that the load provided by the turgor pressure must have been shifted to the outer membrane in these wall-less cells. To test the mechanical properties of the outer membrane, we performed a straightforward experiment (you can find our paper here): first we deflated the cells (which are normally inflated like little water balloons) using a large hyperosmotic shock, which caused the cell sacculus (i.e., the cell wall/outer membrane complex) to contract (Movie 2, Fig.1). Next, we damaged the outer membrane using either a detergent or EDTA. Both of these treatments caused the cell sacculus to contract even further, about twice as much as deflation alone had caused. We interpreted this result to mean that after deflation, the outer membrane was supporting the cell wall at a size well above its most relaxed state; when the outer membrane was damaged, the wall could relax to a size closer to this state. We concluded from this simple experiment that 1) the stiffness of the outer membrane was on the order of the stiffness of the cell wall, and 2) the resting size of the outer membrane was greater than that of the cell wall. In fact, we tested outer membrane mechanics using several other assays, and all of our data indicated that the outer membrane is actually stiffer (perhaps much stiffer) than the cell wall! These properties turned out to be critical for certain physiological processes, such as survival during osmotic fluctuations (Movie 3) and proliferation of “L-form” bacteria. Large hyperosmotic shock causes deflation of the cells and contraction of their cell envelopes, including the cell wall/outer membrane complex. Further removal of the outer membrane caused a second contraction of the cell wall, leading us to suspect that upon deflation alone, the outer membrane was stabilizing the cell wall above its relaxed size. Another way to interpret our measurement that the outer membrane is much stiffer than the cell wall, despite the fact that the cell wall is a covalently linked macromolecule, is that the cell wall simply isn’t a cell wall if you damage or remove the outer membrane. In this framework, the cell wall and the outer membrane act as a single, strange, mechanical material. Curiously, along the way, we stumbled across the fact that the cell wall can act as a permeability barrier to certain proteins or protein complexes. That is, whereas the textbooks would tell you that the cell wall is a mechanical element and that the outer membrane is a permeability barrier, our data suggested that each of these structures can serve both functions, and it may be useful, in certain contexts, to view them as a single structure. All right, so why do Gram-negative cells have two membranes? We still don’t know the full answer, but the key may lie in its multiple functions. To dissect these functions in more depth, further research needs to measure the interdependence between the chemical and mechanical roles of the outer membrane. In particular, it is intriguing that lipopolysaccharide, which is a potent antigen that stimulates the mammalian immune system, thereby endangering pathogenic bacteria, also provides mechanical integrity to bacteria and therefore protects them. Similarly, we expect that outer membrane mechanics will manifest in a range of other physiological processes including cell morphogenesis, antibiotic susceptibility, and bacteriophage transmission. In any case, one thing is for sure: the outer membrane appears to be a key structure for surviving and proliferating when the cell wall is compromised, which is to say, the border wall is not necessary for cell security!